Cash Dash is a platformer styled gamethatchallenges you to beat each level in 3 mins or less in order towinbadges and shoot to the top of the global leaderboard. 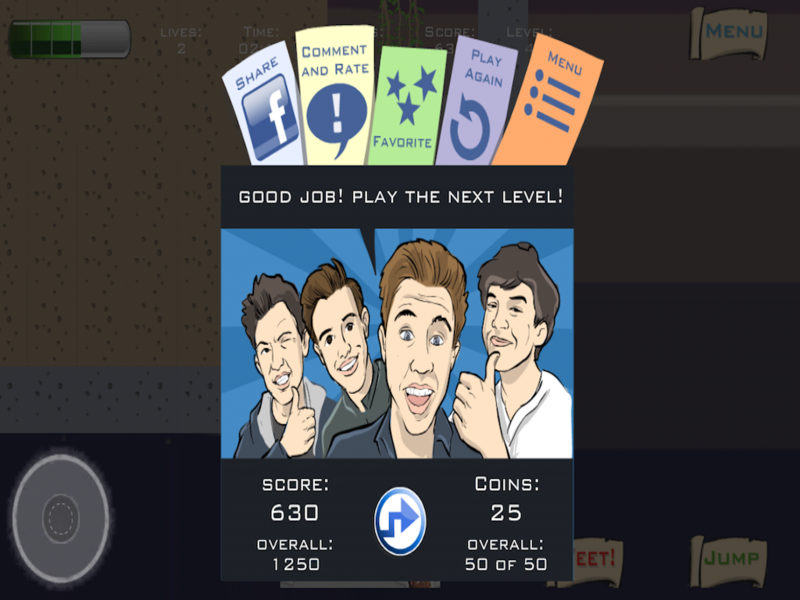 ChooseNash,Cameron, Carter, or Hayes and complete all 70 levels. 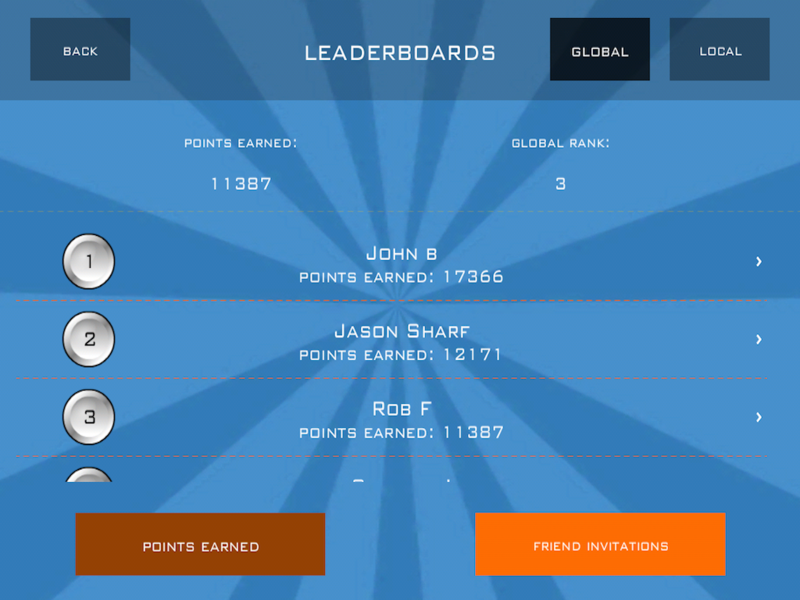 Each week there will be new levels added and digital rewardscanbe earned. So, make it to the top of the leaderboard to havethebest chance to be followed by the boys, to be added as theirfriendwithin the app, and receive push notifications when they havenewvideos and tweets! Nash Grier is a social media phenom from North Carolina.Withmore than 9m followers on Vine (more than Ellen DeGeneres,MileyCyrus & Justin Bieber); more than 6m on Instagram; more3.4m onYouTube; and, more than 3.2m on Twitter, he has taken thesocialmedia world by storm. This 16 year old's following grows byabout300,000 a week thanks to his mix of slapstick comedy,songparodies, adolescent humor and videos often co-staring hisfriendsand family. At only 18 years old, Carter Reynolds is already a socialmediasuperstar. He has over 3.5m followers on Vine, 2.1m onInstagramand over 1.5m on Twitter. Originally from South Florida,Carter nowlives in North Carolina. He loves to act, travel, andmake peoplesmile. After astonishingly gaining over 9m combined followers onsocialmedia in only 7 months, Cameron Dallas loves creatinghisimaginative and funny content for his followers. His 1.5mfollowerson Twitter, 2.6m on Instagram, 3.5m on Vine, & 1.6msubscriberson YouTube will be quick to agree that he is the newteenheartthrob. Whether producing content alone or with his groupoffriends, fans all over the world are always eager for hisnextmasterpiece to be posted for their viewing. Born and raisedinCalifornia, he hopes he can continue entertaining the world fortherest of his life. Hayes Grier followed his older brother’s footsteps and becameasocial media sensation. At just 13 years old, he has 3mfollowerson Vine, more than 2.6m on Instagram and over 1.5 milliononTwitter. He is a rising star in the entertainment world.Touringthe US at various events, he has his large fan base ofloyalfollowers eager to meet him in person and watch himperformlive. 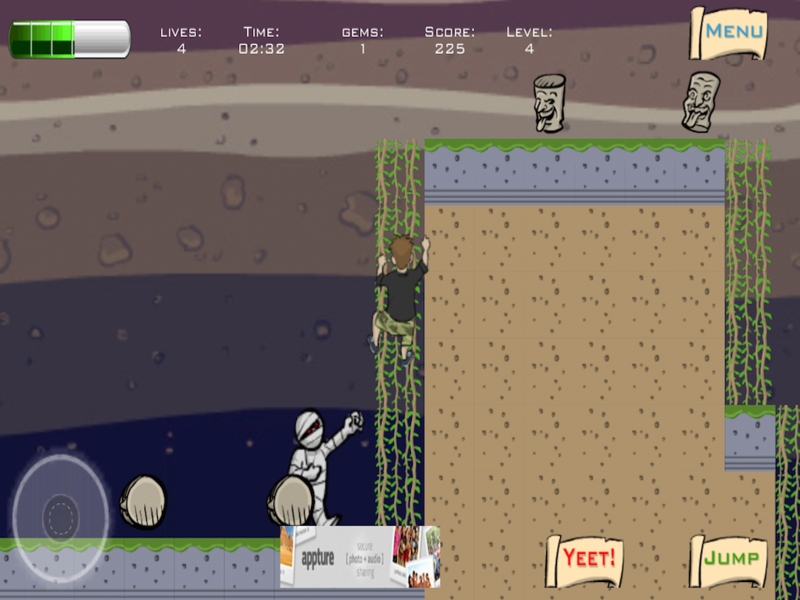 Cash Dash is a platformer styled gamethatchallenges you to beat each level in 3 mins or less in order towinbadges and shoot to the top of the global leaderboard. ChooseNash,Cameron, Carter, or Hayes and complete all 70 levels.Each week there will be new levels added and digital rewardscanbe earned. So, make it to the top of the leaderboard to havethebest chance to be followed by the boys, to be added as theirfriendwithin the app, and receive push notifications when they havenewvideos and tweets!About the Boys-------------Nash Grier is a social media phenom from North Carolina.Withmore than 9m followers on Vine (more than Ellen DeGeneres,MileyCyrus & Justin Bieber); more than 6m on Instagram; more3.4m onYouTube; and, more than 3.2m on Twitter, he has taken thesocialmedia world by storm. This 16 year old's following grows byabout300,000 a week thanks to his mix of slapstick comedy,songparodies, adolescent humor and videos often co-staring hisfriendsand family.At only 18 years old, Carter Reynolds is already a socialmediasuperstar. He has over 3.5m followers on Vine, 2.1m onInstagramand over 1.5m on Twitter. Originally from South Florida,Carter nowlives in North Carolina. He loves to act, travel, andmake peoplesmile.After astonishingly gaining over 9m combined followers onsocialmedia in only 7 months, Cameron Dallas loves creatinghisimaginative and funny content for his followers. His 1.5mfollowerson Twitter, 2.6m on Instagram, 3.5m on Vine, & 1.6msubscriberson YouTube will be quick to agree that he is the newteenheartthrob. Whether producing content alone or with his groupoffriends, fans all over the world are always eager for hisnextmasterpiece to be posted for their viewing. Born and raisedinCalifornia, he hopes he can continue entertaining the world fortherest of his life.Hayes Grier followed his older brother’s footsteps and becameasocial media sensation. At just 13 years old, he has 3mfollowerson Vine, more than 2.6m on Instagram and over 1.5 milliononTwitter. He is a rising star in the entertainment world.Touringthe US at various events, he has his large fan base ofloyalfollowers eager to meet him in person and watch himperformlive. *** NEW UPDATE IS HERE ***-New beautiful urban favela level, new control options, Watchreplay, IAP Sale, bug fixes and more.-Check out the facebook page for more screenshots and updates. **Bike Dash performs better on new devices : Samsung Galaxy 5capability and alike.Feel the rush as you ride your bike across hazardous trailsavoiding obstacles while performing gravity defying tricks to reachthe farthest you can.The game combines authentic mountain bike downhill action withan extreme endless runner.Earn extra coins by performing tricks and combos in huge jumps.Level up to unlock more insane tricks and upgrade your gear.FEATURES:3 Maps - Richly detailed Forest, Desert and Urban favelatrails.Switchable First Person and third person view.15 amazing Tricks to unlock.Over 20 Gear items to upgrade.Epic Ragdoll bones breaking, blood splatering crashes.Upgradable perks.Online leaderboards and achievements.Addictive Gameplay! UNIQUE SYMBIOSIS OF MUSIC AND GRAPHICSDub Dash is a fast-pacedrhythm based action game. The tracks are decomposed into diverginggame mode segments. The obstacles, tracks and visual effects areall adjusted to the music and in perfect harmony with each song.Dub Dash has a great soundtrack including music from Bossfight andthe DJs of Geometry Dash – to enjoy the full experience the use ofheadphones is highly recommended. 7 ULTRA CHALLENGING MODES Spinyour crazy wheel in harmony with the song and keep dodging left andright avoiding obstacles at high speed. Fly like a bird, make hard90° turns and feel the rhythm of the zig-zag trajectory. Theobjective for each track is clear: Do you rock the funky road ofDub Dash? PRACTICE MAKES PERFECT The gameplay of each segment issimple but it´s tough to master the levels. Actually it´s extremelyhard, almost impossible – but fortunately there´s the practice modewhich gives you a save point after each passage so you won´t needto finish the whole level in one try. Memorize each segment of thelevel and maybe (only maybe) you will be able to master even thehardest levels someday. EARN EXTRA-LIVES IN RANDOMLY GENERATEDDAILY LEVELS Earn up to 15 bonus lives in the daily challenge mode.Each level is randomly generated to the beats and your extra liveswill come in handy in your next approach to finish alevel.FEATURES:- Rhythm based action game- Great soundtrackincluding Bossfight and DJs from Geometry Dash- Challenging levelswith groovy tracks and stunning effects to the beat of the music- 7different game modes requiring fast reactions- Practice mode-Google Play Game Services- Tablet support(c) 2016 - Developed byIncodra UG (www.incodra.com) - Published by Headup Games.Follow uson Twitter, Facebook and Instagram:www.facebook.com/dubdashgamewww.twitter.com/dubdashgamewww.instagram.com/headupgamesIfyou have problems with the game or feedback please send an emailto:[email protected]nsitiveSeizure Warning A very small percentage of people may experience aseizure when exposed to certain visual images, including flashinglights or patterns that may appear in video games. Even people whohave no history of seizures or epilepsy may have an undiagnosedcondition that can cause these "photosensitive epileptic seizures"while watching video games. These seizures may have a variety ofsymptoms, including lightheadedness, altered vision, eye or facetwitching, jerking or shaking of arms or legs, disorientation,confusion, or momentary loss of awareness. Seizures may also causeloss of consciousness or convulsions that can lead to injury fromfalling down or striking nearby objects. Immediately stop playingand consult a doctor if you experience any of these symptoms.Parents should watch for or ask their children about the abovesymptoms - children and teenagers are more likely than adults toexperience these seizures. The risk of photosensitive epilepticseizures may be reduced by taking the following precautions:• Playin a well-lit room• Do not play when you are drowsy or fatiguedIfyou or any of your relatives have a history of seizures orepilepsy, consult a doctor before playing. THE BIG BALLS ARE BACK WITH THE SEQUEL TO THEAWARD WINNING MOBILE GAME, WIPEOUT!See what folks are saying about Wipeout 2!“Big Ball Bonanza!” – Apple n Apps“Fans will instantly feel at home” – 148 AppsNow you can bring the fun and excitement of the popular WipeoutTV show to life in a whole new way! Tackle wacky obstacles and pulloff hilarious Wipeouts in 135 levels anywhere you go! Run, jump anddive through your favorite challenges from the hit show. Do youhave what it takes to conquer the Big Balls?GAME FEATURES:PLAY AS CRAZY NEW CHARACTERS ON OUTRAGOUS THEMED OBSTACLES: Play as10 hilarious characters including a Zombie, Pirate and Popstar asyou run through 150 zany themed obstacles!• COMPETE AGAINST FRIENDS: Watch your progress on the social mapand leaderboards to see how you stack up against yourfriends.• CRASH, BASH AND DASH THROUGH THE COURSE OF THE DAY: Try your handat new daily courses to unlock special rewards!• ADD FUN UPGRADES AND ABILITIES: Customize your character withperformance enhancing costumes and abilities like rewind, teleport,and speed boost.• BIG BALL WORTHY DAILY REWARDS: Receive a variety of rewards,including coins and power-ups!This app offers in-app purchases. You may disable in-app purchasingusing your device settings. Over 190,000,000 downloads worldwide!Play now the #1 addictive game of the year!Tap the ball carefully through each obstacle and your ball willswitch color with some powerups.You must follow the color pattern on each obstacle to cross it!Be careful not to pass through the wrong color, or you’ll have tostart again. How high can you dash? Dash the ball as high as you can to beatyour friends score! Be careful of those blocks and don't let itclose on you. They are Dangerous!Don't be deceived by its simplelook.. It's difficult and addictive!! Once you start, you can'tstop!Tap on "Mode" button to switch between following game modes:1.Normal Mode2. Stealth Mode: Dash with a Stealth Ball. Can you seethe ball ?3. Dark Mode: Dash in the Dark!!!4. Christmas Mode:Dashing through the snow5. Tennis Mode: Spin, Spin, and Spin theball6. Valentine Mode: Love is in the air. RPS DASH is free game that matches the "Run Game" and "rock, paper,scissors". Power up with coins! Try the power-up of the magnet andalter ego. Gingerbread Dash! is a new side-scrolling jumping game developed byAteam Inc. Gameplay consists of helping the Gingerbread Man runawayfrom the Giant Fox without falling into the water or being caughtby other animals.The Gingerbread Man! is controlled by tilting theAndroid device in the desired direction, with greater tilt equalinggreater movement speed.When playing, collect stars to make poweritems appear that will assist the Gingerbread Man's flight from hisdark fate.